Well, August wasn't exactly a breakout month in home sales but the Chicago real estate market did recover nicely from its abysmal performance in July. August closings did exceed last year by 5.4% but in about 2 weeks the Illinois Association of Realtors will report it as only a 2.6% increase. In the graph below I've flagged all the August data points in red and also have a blue 12 month moving average line. 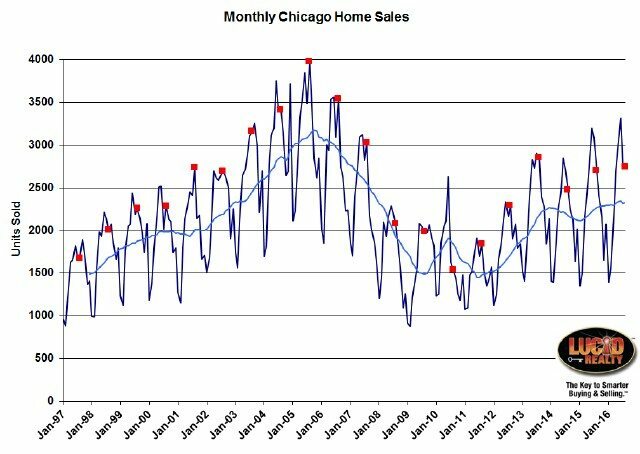 Look carefully at that graph and you will see that August Chicago home sales were higher than 7 out of the past 8 years but that the moving average is really losing steam with last month's disappointing performance. We are also rapidly heading towards the seasonal depths of the market. The one fly in the ointment is that contract activity remains weak with my revised estimate for July at 11.2% below last year and my August estimate down 5.5% from last year. That is why the blue moving average line in the graph below is pointing down right now. This can't bode well for future home sales which usually lag this metric by a month or two. 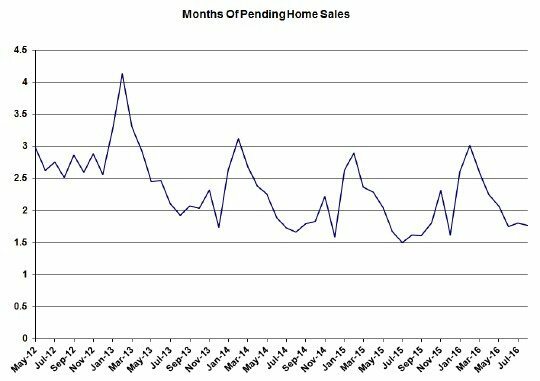 If you will recall pending home sales rose last month over the previous year and I'm sure that helped drive August sales higher. There could be timing differences at work here or fewer contracts are falling apart. August ended with a 1.71 month supply of pending home sales compared to a 1.62 month supply last year. So, again, there could be some assistance from this pipeline in September. 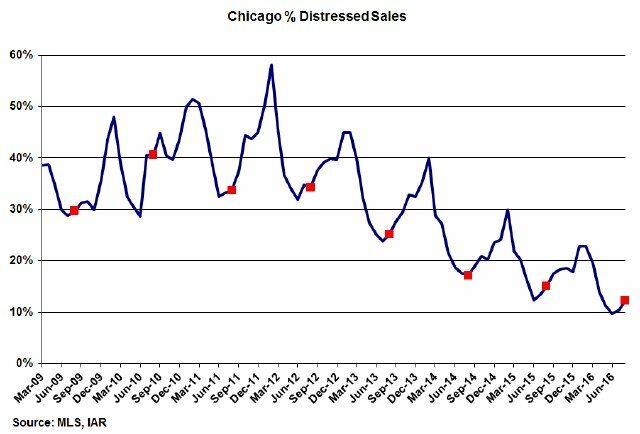 Once again the share of distressed home sales hit another record low for August at 12.4% and, as you can see in the graph below, each year's decline has been smaller than the previous year's decline as we approach the limits of what is possible. It's not getting any easier for buyer's out there. The available inventory just keeps hitting new record lows. Detached homes dropped to a 4.4 month supply compared to a 5.5 month supply last year, while condos and townhomes dropped to a 3.1 month supply from last year's 4.0 month supply. Keep in mind that these are averages for the entire city of Chicago. As I pointed out about 3 weeks ago detached inventory is actually dramatically rising in several higher income neighborhoods: Signs Of Weakness In The Chicago Real Estate Market. The trend in market times is consistent with this tight inventory picture and is demonstrating significant declines. 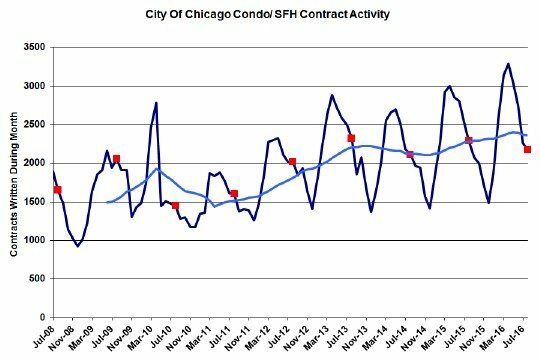 Detached homes went under contract in an average of 78 days compared to 87 days last year while attached homes went under contract in only 60 days compared to 65 days last year.